40th Anniversary of Les Clefs d’Or Canada continues throughout 2016! Day 29 – 2005 Geoff Argue is elected as the 7th President! In May 2005, at the Pan-American Congress of New Orleans, USA, Geoffrey Argue was elected as the 7th President of Les Clefs d’Or Canada. 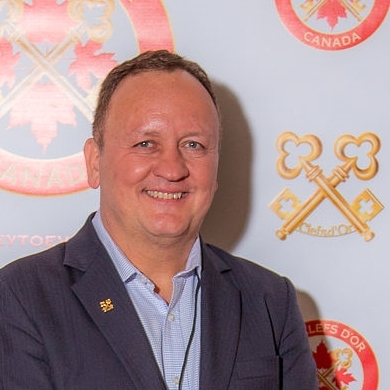 Geoffrey Argue, President of Les Clefs d’Or Canada from 2005 to 2009. Geoff was, and still is, the Chef-Concierge at the Sutton Place Hotel in Vancouver. Among his greatest achievements during his two terms as President, Geoff cites the organization of the 15th Pan-American Congress in Vancouver and the creation of the 7th Region of Les Clefs d’Or Canada, the Atlantic Region. Geoff Argue went on to serve on the Executive Board for another two years as Past-President and he was later named as a member of the Comité des Sages (Committee of the Elders), a position he still fulfills brilliantly to this day! Personally, I had the honor and privilege to hear Geoff make an insightful speech on the future of the concierge profession, in front of more than 500 concierges gathered at the Vienna International Congress, in 2007. That was, in my opinion, one of the greatest moments for a Canadian President on the International scene. We will relive with you our rich history, one year at a time, and remember the amazing people who made it all happen since the day of our adhesion to the International association of Hotel Concierges, Les Clefs d’Or – UICH. ← 40 Years in 40 Days – Day 28 : Québec City becomes a Region.